This is a sampling of our daily menus. Please understand that we have a rotating menu, which may be changed due to seasonal availability and other factors. We are happy to modify the menu for special dietary requests and allergies. 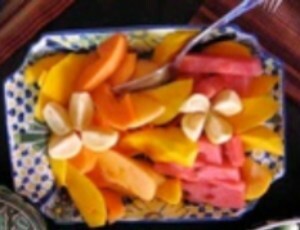 Plato de Fruta- (Our tropical fruit plate with mango, papaya, melon, watermelon and other in-season fruit). Santa Clara Durazno - (Peach) Yogurt. Choice of Gourmet Chiapas coffee, tea, hot chocolate, or atole. Pescado Empanizado con Pico de gallo - (Breaded Fish Filets lightly sautéed with a tomato-onion salsa). Arroz Verde con Rajas y Crema - (Green Herbed Rice with creamy slices of Poblano Chile). Papas Fritas - (Fresh Potato Chips grown right in Dolores Hidalgo). Ensalada de Espinaca con aderezo de J’amaica - (Spinach Salad with crimson-colored J’amaica flower dressing). Agua de Piña - (Refreshing Pineapple beverage with purified water). Pan Tostada a la Francesa - French Toast. Plato de Fruta: mango y sandia - Watermelon and Mango. Choice of coffee, tea, hot chocolate, atole, or Café de Olla. Santa Clara Yogurt de Cereza (Cherry). Tortas - Overstuffed grilled sandwiches on Crusty fresh-baked French rolls! Sopa de Zanahoria - Crème of carrot soup. plus Ancho chiles en escabeche stuffed with platanos and cheese. with grilled tomatoes and onions. Papas Fritas Francesa - French Fries. Ensalada de Caesar - Caesar Salad. Nieve de Piña - Fresh Pinapple Sherbert. Agua de Sandia - Refreshing Watermelon Beverage. Huevos Rabos de Mestiza- Poached eggs swimming in a tomato-cheese sauce. 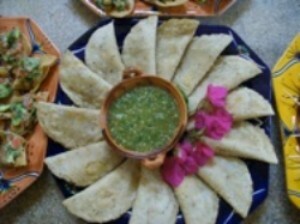 but wrapped in a flour tortilla, served with a variety of salsas- mango, chipotle, and guacamole. Sopa de flor del calabasa - Delicate and creamy Squash blossom soup. Enchiladas Verdes y Rojas - A lovely mixture of chicken, potatoes and cheese with red and green salsas. Frijoles Negros - Black beans in a tasty broth. 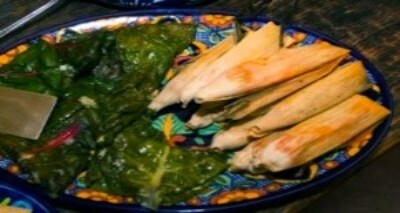 Quelites - Braised wild Amaranth Greens. Ensalada de Pepinos en crema y vinagre - Creamed cucumbers with a touch of vinegar and herbs. Brownies con Helado de Vanilla Fresco. Juevos Motulenos - Ham and Egg tortilla sandwiches with peas and salsa. Choice of coffee, tea, hot chocolate, café de olla. Huevos Mexicanos - Traditional-styled scrambled eggs with tomato, onion, and chile. 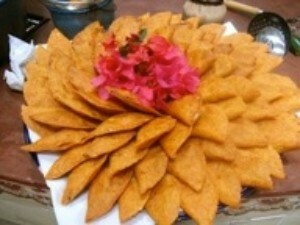 Torta de Papa en Flor de Calabasa- Potato pancakes cradled in squash blossoms (when in season). Plato de Fruta de Uva, Piña, y Platano - Fresh fruit plate with grapes, pineapple, and bananas. Sopa de Verduras - The best home-made vegetable soup you’ve ever tasted. Crema de Flor de Calabacita - Delectable creamy Squash-blossom Soup. Arroz con Leche - Rice pudding. Sopa de Tortillas- The quintessential Mexican soup, a hearty meal of tortillas, tomatoes, avocado, and cheese. Huevos diablados Mexicanos- Mexican-style deviled eggs. 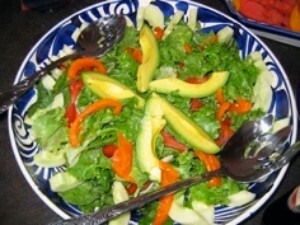 Ensalada de Lechugas con aderezo limón y cilantro - Mixed green Salad made lively with lime/cilantro dressing. Limonada de agua mineral - Fresh-squeezed lime-aid made with mineral water. Albondigas - Delectable Mexican style meatballs bathed in a tomato broth. Ensalada de Lechugas con Adereso Balsamico - Various Gourmet Lettuce with balsamic dressing. Postre de Flan - Mexico's famous egg custard with a syrupy surprise. Agua de Limon - Lime-ade, so refreshing, some choose it every day! Arroz Blanco con Platanos Fritos -White rice with fried plantains. Calabacitas - Stir-fried Zucchini with fresh herbs and a sprinkling of cheese. Agua de Tamarindo - Refreshing Tamarind Beverage. Huevos Omeletes de queso y salsa poblano - Cheese Omelette with a lovely green poblano sauce. Papas con salchicha - Potatoes with sausage. Chilaquiles - A hearty tortilla and salsa brunch delight. 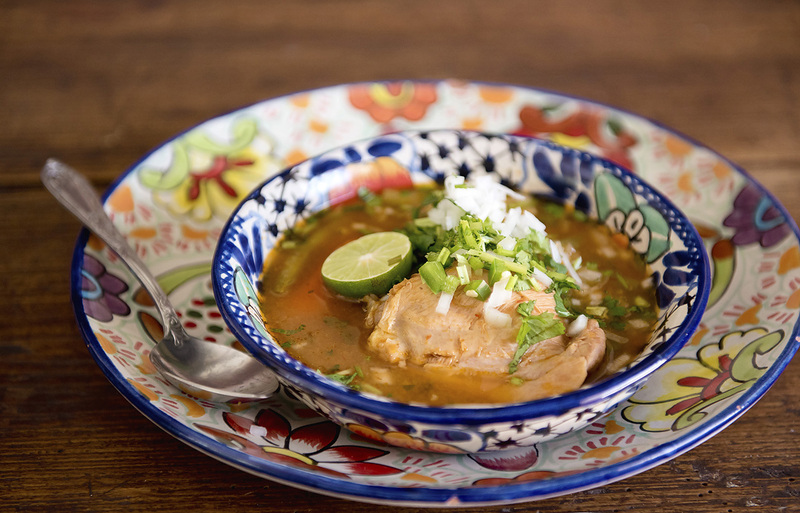 Caldo Tlalpeño - Smoky garbanzo/vegetable chicken Soup. Ensalada de Jicama y piña - Jicama-Pineapple salad. Sopa de Champinones, Chayotes, y Nopales - Grilled Mushroom, Chayote and Cactus soup. 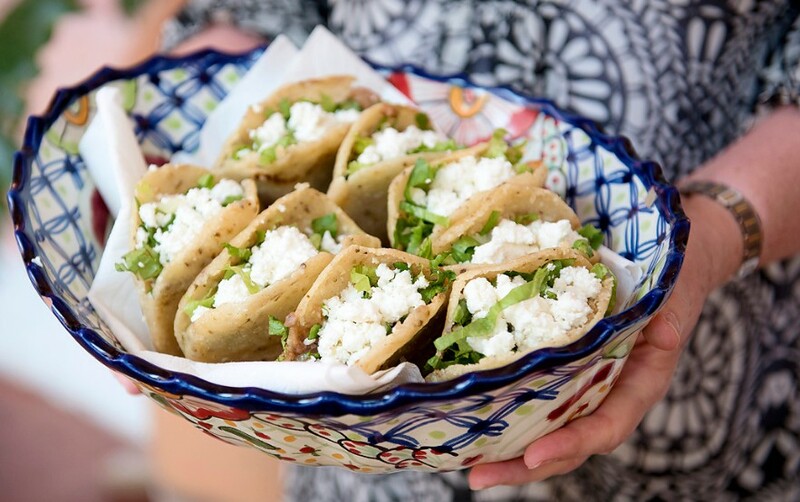 An unbelievably delicious introduction to nopales. 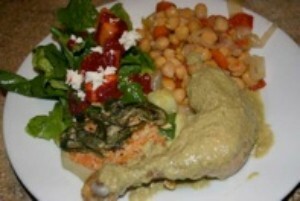 topped with a delicious dressing of papaya seed vinaigrette. Crimson Iced tea made with hibiscus flowers. Helado de Coco - Fresh coconut ice cream.